Elijah Mikaelson is an Original Vampire who was born to Mikael and Esther in the 10th century. Elijah has six siblings, a deceased unnamed older brother, three younger brothers whom are now deceased (Finn, Kol, Henrik) and a younger sister named Rebekah. He also has a younger half-brother named Niklaus. Elijah is currently the eldest Original alive and the oldest immortal being in the world, now that Silas, Amara and Mikael are all deceased. Elijah is also the most powerful being, second only to his half-brother, Niklaus and this is only due to Klaus being a Hybrid. Over the centuries, Elijah has been romantically involved with certain women while being with his siblings and running from his father. In the 10th century, while Elijah and his family were still human, both he and his brother Klaus were in love with Tatia, though it is unknown if she returned their affections. 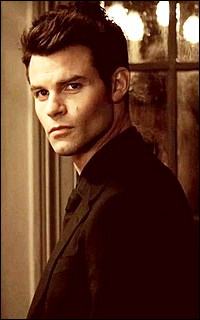 In the 15th century, Elijah was involved with Katerina Petrova, the doppelgänger of Tatia. In the 19th century, he was involved romantically with a witch named Celeste Marie Helene Dubois, who later died in a Witch hunt, caused by his brother. Now in the 20th century, Elijah rekindled his relationship with Katherine and they had a romantic relationship until he broke up with her and left. Elijah is described as unpredictable, over-protective and stubborn, but also very kind, intelligent, selfless, empathetic, compassionate, and friendly. He is extremely loyal and has a loving nature. But in spite of this, Elijah is very naive and easily manipulable. He strongly believes in trust, honesty and loyalty and whenever he would give his word to someone, he would keep it, as he has said "I'm a man of my word". Elijah has been known to break deals but only when he realized he was lied to such as in his deal with Sophie Deveraux. He has a lot of respect and admiration for human life, which is unseen in many other vampires and is normally very reluctant to kill anyone when unnecessary.